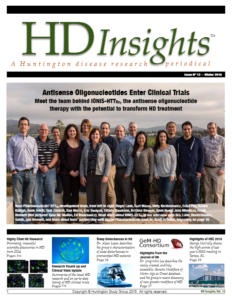 Job description: If you are passionate about HD research and want to reach nearly 3,000 HD researchers and clinicians around the world, consider joining our team as the Deputy Editor of HD Insights. Oversee the creation of 3-4 editions per year of HD Insights. Responsible for soliciting, editing, and coordinating review and layout of each edition, as well as contributing original articles and ideas for the publication. Ideal candidates will have experience in academic writing, be familiar with Huntington disease research and have the flexibility to work remotely with individuals all over the world. Training and supervision will be provided remotely by the outgoing Deputy Editor and current Editor. Ideal start date is Q2 of 2017. Compensated position. Please send CV and letter of interest to editor@hdinsights.org.